The better the weather the lower the turnout! Saturday 22nd May was glorious and our numbers suffered accordingly. It was a shame in a way because our speaker, Aaron Bray, a Cornishman who had escaped to Devon, was very interesting. Aaron started life as a quarry engineer, with his brother inherited his father’s rock drilling company, bought out the competition and a couple more drilling rigs, and now has 32 employees. He is one of the few drillers who is a dowser himself. 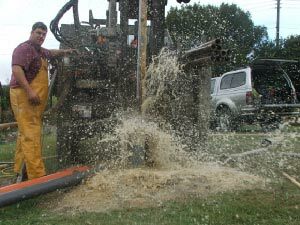 As dowsers, with a Chairman who still goes out to farmers, smallholders, garden centres, etc., to find the best spot for them to find an independent supply of water, it was fascinating to hear what happens after we’ve said, "OK, sink your bore hole HERE!" Aaron drills all over the country, and knows the geology of the southwest, the Channel Islands and Scotland like the back of his hand. In the southwest it’s mostly hard rock, so he uses a 6-inch air rotary hammer drill, which pulps the rock as it sinks through it, and is pumped out by air. When you hit water, it can be quite spectacular, since it is usually under pressure, and release can bring fountains 10 or 20 feet high. Then you have to dash for cover. Eventually it eases up and you can sink your 4-inch lining and your one-metre long, three-inch diameter pump. Before he gets that far, however, Aaron has to consider such variables as site access, weight and height restrictions, buildings, foundations, nearby burial sites, even hedges, which can be ancient, and the neighbours, who are sensitive to noise. Undergound pollution is a major consideration, as run off from pig sties, cowsheds and even the local graveyard, can affect the quality of the water. Aaron’s other preoccupation is, of course, cost. Insurance alone is £20,000 a year, plus labour, transporting the rig on a low loader, and massive amounts of diesel, all add up. His services can cost from £2,500 to £6,000 and in some cases £10,000, depending on depth. "The deepest I’ve drilled," said Aaron, "is 210 metres." Once the bore hole is finished, water often needs to be filtered, treated and stored. Depending on your source, you can expect between 2 and 60 gallons per minute. At the end of the day though, however deep you drill, and regardless of cost, it is a fact that you can only take what water is there. So it is vitally important to find the right site to start with and Aaron is always worried until he gets that final confirmation that yes, they’ve found water. Afterwards, we went to the fields across the road to practice water divining using the methods Aaron had described during his talk. "'andsome amount of water there boy!" 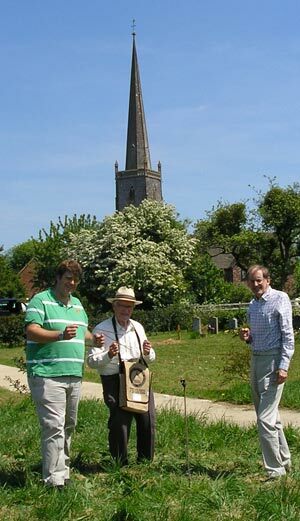 Speaker Aaron Bray (left), Chairman Peter Golding (centre) and Barry Goldring (right) practice water divining methods in Slimbridge Cemetery field.